April is here, and this month is going to be hectic for many of us coz of kid's exams else coz of their vacation. For me its going to be hectic coz of a month of long month marathon. Monthly we do three days of blogging marathon but April is everyday posting and for this month's theme, we chosed to cook from many Indian states. Being a South Indian, i always love to cook North Indian foods very much, seriously this month's blogging marathon pulled myself and my co marathoners to explore not only different Indian regional cuisines but their cultures and the way they cook their foods.Today, am taking you all to one of the famous South Indian flavourful Andhra Cuisine. Andhra Pradesh is a state situated along the south-eastern coast of India. The charm of the Andhra Pradesh cuisine is the delightful blend of original Andhra, delicious Southern and brilliant Hyderabadi style of cooking. While the original Andhra food is hot and fiery in nature, Hyderabadi food brings the Mughal influence into the Andhra cuisine.The cuisine of Andhra Pradesh is a foodie’s delight. The food of every Indian state has a certain kind of uniqueness to it and the same holds true for the cuisine of this state too. Abundant use of spices and exotic seasonings mark the cooking style of Andhra Pradesh. This cuisine sees a healthy mix of vegetarian and non-vegetarian items. A large chunk of the population is vegetarian and has devised brilliant vegetarian recipes. The people along the coastal areas have developed amazing seafood recipes. As Andhra Pradesh was under the rule of Mughal Emperors the cuisine of the land has been heavily influenced by the Mughals and this influence is reflected in the world-famous Hyderabadi cuisine.For the first day of this long marathon with Indian states as theme, i cooked this delightful Tamatar Ka salan from Hyderabadi Cuisine. Make four incisions as perpendiculr cuts from the end of each cherry tomato, taking care to keep the other end intact,keep aside. Meanwhile puree the onion as smooth paste, also grind the spices given under the list ' to grind' as smooth paste with enough water. Heat enough oil in a pan, let crack the cumin seeds, curry leaves, mustard seeds, nigella seeds and fenugreek seeds. Once they starts spluttering, add the pureed onion and cook in simmer until the raw smell of onions goes away. Add now the ginger garlic paste, salt, red chilly powder, turmeric powder, chopped coriander and the grounded masala paste, mix well. Cook in medium flame until the raw smell of the masala paste goes away and oil starts leaving on the sides. Add the tamarind pulp, mix well, add in 4cups of water,mix and let it boil. While boiling, add the prepared tomatoes, cover it with a lid. Let it cook for few minutes, once the tomato turns soft, remove from heat. Serve with pulao, briyani or simply with rice..
Nice hyderabdi dish! Yes, the Hyderbad Nizams have influenced Telugu cuisine a lot. This is perfect dish to serve biryani, pulao and also with rice. This is such a wonderful recipe,loved the color of it..Never tried salan with tomatoes,sounds very inviting..
Oh my such an delicious salan that too with tomato :) looks irresistible and super aromatic one :) I so very curious to see what you have in bags for mega marathon aks :) very delicious start looking forward for more such delicious recipes !! Awesome recipe and so looking forward to this month! I love the salan gravy, but never though of using cherry tomatoes. Will try this for sure this summer when i have a overload of cherry tomatoes! Very flavorful gravy, Priya. My sister's MIL shared with me the same recipe and is one of our favorites now. Wow Priya this surely looks delicious. New for me . Bookmarks surely are going to increase. Wow thats really tempting priya!!! That curry looking amazing Priya. wow that's superb priya..awesome looking and yes we ourselves came to know so much new right!.. 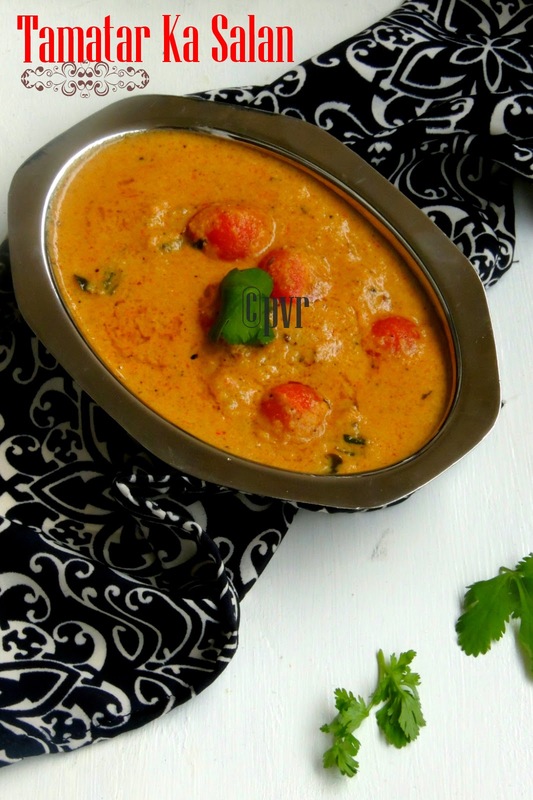 Delicious and lovely looking tomato ka salan. Wonderfully prepared. Ilove Mirchi ka salan,its seems to be different one..looks soo inviting!! Love the color, very nice recipe choice. All the best for your marathon, look forward to more recipes. Looks absolutely tempting and delicious!! salan looks delicious, bookmarking this..
Never heard of anything else than mirchi ka salan. this one looks fantastic! Different and yum with cherry tomatoes. This Tomato salan would taste wonderful with pulao. Looks really tasty. Mirchi ki Salan i know, i dont know salan can be made with tomatoes too. Tomato Salan look so inviting. Love the photo. something new to me sis.. will give a try..
Inviting & tempting gravy.. I have had mirchi ka salan but with tomatoes that is one yummy dish. What a good looking gravy that is! I always make michi ka salan but never tried tamatar ka salan. Looks and sounds awesome.I love teh way you explain how to keep the tomato intact. Love the radiant color of this gravy..Looks great dear..
the color the texture everything is just super dear! I always wanted to try mirchi ka salan,never knew this tamatar ka salan, this pic is tempting me now to try them soon..
Don't worry you will def gng to rock aks.this makes me tempting. Looks so delicious, can polish off the whole plate with some rotis.. This is my favorite salan recipes Priya, thanks for sharing this, looks very good! Andhra without a Salan ? :) Impossible I guess. I have never heard of this tomato salan and is very inviting. I love the colour and texture of the salan and I have always made it with mirchi...shd give this one a try soon! Love the gravy of this salaan.